The Russian Lower House speaker wants to instigate an international investigation into the 1945 nuclear bombing of Hiroshima and Nagasaki by the US military – a possible crime against humanity with no statute of limitation. “Next year we will have the 70th anniversary of the Nuremberg Trial and also the same anniversary of the first and only nuclear bombings of two civilian cities – Hiroshima and Nagasaki. It is not incidental that I mention these events together. I think we should discuss this topic together with lawyers and specialists in international law – for crimes against humanity have no statute of limitation,” Sergey Naryshkin told the presidium of the Russian History Society. The Russian parliamentary chief recalled that the nuclear attacks on Hiroshima and Nagasaki were hardly justifiable from the pure military position, as the defeat of Japan was practically decided after the Soviet Army’s victories in Manchuria. “The nuclear bombing of two peaceful cities was a pure act of intimidation resulting in the deaths of several thousand Japanese civilians. Let us get back to this issue within the next year,” Naryshkin said. 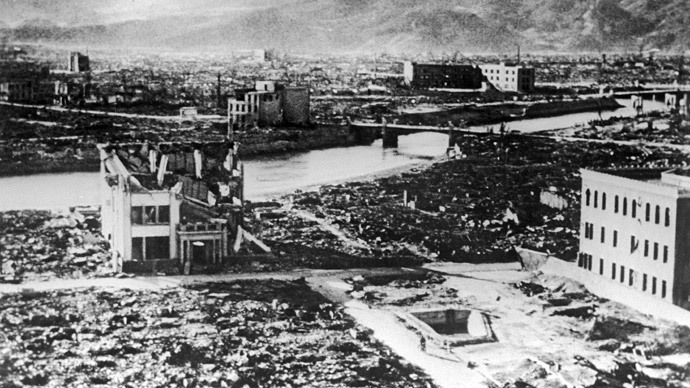 The nuclear bombings of Hiroshima and Nagasaki took place in early August, 1945, and resulted in the deaths of between 150,000 and 250,000 people, most of them civilians. The US authorities said the demonstration of force sped up Japan’s capitulation and prevented a land operation on the island that could have inflicted heavy casualties to the US military. At the same time, the two attacks, especially the Hiroshima bombing, have been repeatedly denounced by the international rights community as fundamentally immoral and violating the spirit of conventions that banned the use of weapons of mass destruction against the enemy’s civilian population. Japanese officials and international rights activists raise the issue of the bombings to this day, noting that the radioactive fallout damaged Hiroshima and Nagasaki’s children, causing various illnesses in some, and costly medical checks and constant fears for the health of the rest.